I’ve read a story from this anthology every night up to Christmas Eve! It was just a fun little treat to myself and something that helped me get even more into the holiday season (along with The Sorcerer’s Stone Illustrated Edition). 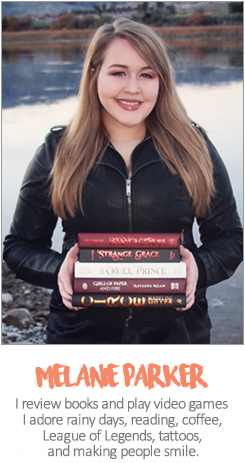 I was very surprised, because I absolutely adored a few stories by authors I’ve never read before. Then, in turn, a few of the bigger named authors I’ve read and loved were disappointments. Overall, this really is a heartwarming book filled with lots of holiday cheer. I definitely recommend this book to be read in December, by your fireplace, with lots of hot chocolate on hand! The cover of this book needs to be talked about. 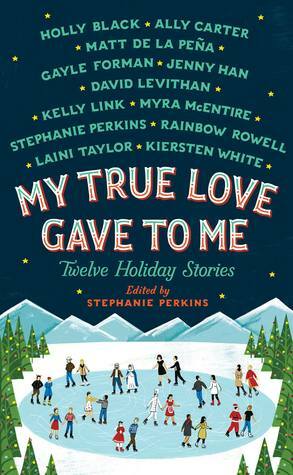 It’s obviously a perfect fit for a holiday collection book, but upon further inspection you’ll realized that all the couples ice skating are from the twelve stories! Like, how perfect is that? Seriously, wonderfully done! This was really well written, but it just didn’t hook me the way I thought it would. It was a flash back through the past four New Years Eves, and what happened as the clock struck midnight. This starts sophomore year of high school and ends freshman year of college. The story did do a wonderful job making the reader reminiscent about growing up and feeling like everyone around you was changing. Especially when coming home from college and seeing your old high school friends. Rainbow Rowell can string together such beautiful stories, but this one seemed a little boring to me (kudos to her for mentioning the University of Michigan though). This also seemed a little awkward for me, because it was placed as the first story in a holiday anthology, when it’s a story all about New Year Eves. Miranda is a young girl whose mother is in prison for life. She spends every Christmas with her Godmother and her Godmother’s son. They always throw big and elaborate parties, but one year Miranda notices a man outside looking in on the party, and has to go investigate. I didn’t love the ending, because I’m not familiar with this particular folk-tale, but I loved this story so much. It was so beautiful and very engaging, and really showcases unconditional love. Miranda’s devotion completely captivated me, and had me wishing for snow right alongside her. While reading most of my friend’s reviews, I see they didn’t like this one very much. In fact, it seems like most gave it one star. I’m just so shocked, because this was so wonderfully written and put me in such a holiday mood. Maybe they didn’t understand it? Or maybe they just couldn’t connect? But I legitimately had so much empathy for Miranda, and even after I finished I was thinking about this story the rest of the night. So much emotion packed inside thirty pages. This story was so flippin’ sad, and had no real closure! It’s about a boy that’s away at college in New York, and came from a very poor family back in California. He’s cat sitting for his friend during the holidays, and he meets a girl in his friend’s apartment complex. Oh, and they’re snowed in. It was hard for me to connect with the main character, but I had a lot of empathy for him. I couldn’t help but shed a few tears when I read the meaning of the title for this story. I just hope and pray that he doesn’t throw everything away after his cat sitting job is over. This was so original, and I just ate this story all up! I was so happy that not only did it have elves, it was actually set in the North Pole as well! And I couldn’t have been the only person to loved picturing elves going to a mini prom! Yes, it did remind me of Elf with the whole “Santa brought a human home” storyline, but I love Elf, so it didn’t even bother me. I know this one wasn’t as romantic as the others, and I know that it ended with a terrible cliffhanger, but I think this story embodied Christmas with Santa the best. I honestly would read more of this story if the author ever releases it. I know, I feel horrible giving this two stars. I thought since this author put this collaboration together, that her story would be one of the best. Unfortunately, I couldn’t connect with this story at all. Another sad thing is that North is one of my all time favorite boy names, but not even that could redeem this story for me. I think this might have worked much better as a full length novel. That way we could get to know both of their situations and backgrounds better and, in greater detail, the need of North’s voice. This was by far the worst story of the twelve. It was very awkward, and the ending made me really uneasy. Basically, a boy dresses up as Santa for his boyfriend’s little sister, which sounds sweet, but felt so forced. He then has a confrontation with their older sister when he tries to leave. 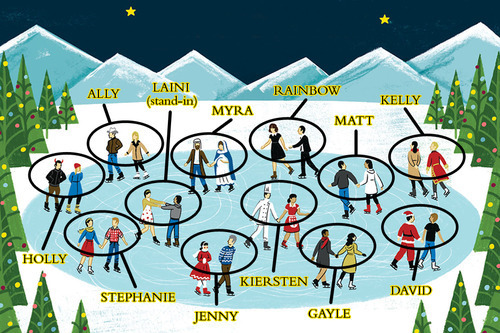 I’m extra disappointed, because I would have loved to have a good LGBT holiday story, instead of this awkward and forced one. This was sweet story about two people trying to find themselves while finding each other. This was also a nice change of pace, because this is a Hanukkah story! I think this story does do a nice job of describing how people can feel so alone, even surrounded by others constantly. It was a little hard for me to connect, just because some of the things that they liked, I didn’t like. I probably wouldn’t be caught quoting The Simpsons to start off a winter romance. And am I the only one that has never heard of eating cheese on apple pie? I liked this more than I thought I would from the title name. This story was surprisingly heartwarming, but it was still so cheesy. I seriously expect this to be a longer made for TV movie on ABC Family or The Hallmark Channel. Gracie is the reserved daughter of a pastor, and Vaughn is a trouble maker with a good heart, but a bad home life. Even though they seem like opposites, they connect and see the good in one another. This is the epitome of what a holiday story should be. This was perfection. It had everything you’d look for in a good holiday tale; it was heartwarming, emotional, had a happy ending, wonderfully written, and was filled with magic. This is a story about a girl that is trapped in a small town. Her mom runs a Christmas themed diner, which she begrudgingly works at, and they just got a new cook! I don’t really want to say much more, because I think going into this story expecting nothing, but receiving everything, is part of the magic. This was my first time reading anything by Kiersten White, but it most certainly will not be my last. This was another very unexpectedly good holiday story! I was so confused why a girl would trade plane tickets with a random girl at the airport, but the realization (on Lydia’s end) was really cute at the end. Sadly, this story really needed to be longer, because we never find out what the deal with Ethan and Hulda’s relationship was. This was very original and very unique, and was a very good installment for this anthology. I think this story will surprise quite a few readers, and most will enjoy this novella immensely. Especially if you like the “cowboy” thing. This had a cool premise, but overall was just really disappointing to me. Basically, if you’re a single lady on this island (where it’s almost impossible to leave), on December 1st though December 24th a suitor can leave you a gift on your porch. After the last day, the island has a ball, where you find your betrothed, and seal the marriage with a dance. I have not read anything by Laini Taylor, but I know many of her books have a lot of hype surrounding them, so I just expected better. This novella was so unclear and rushed. It felt so weak, even in the fantasy department, where I think this book was supposed to shine. Even with a happy ending, this story didn’t make me feel good, it didn’t fill me with holiday cheer, it really didn’t do anything for me. I’m very thankful that I didn’t save this story for last like intended, because I would have been very letdown. I chose to read this story last, because I’m in love with anything Holly Black writes, so I was banking on her for being an amazing Christmas Eve read. Little did I know, this story was very far from a Christmas read! I still loved it, just because Holly Black’s writing style is completely for me, and her story was so different that it would be really hard for me not to appreciate it. There were also a few really good quotes nestled in this really short story. The writing of this novella was better than the other eleven novellas combined. If this story wasn’t for a Holiday Season Anthology I’d give it five stars. I gave this anthology three stars overall, because out of a possible 60 stars (5 stars possible for each of the 12 stories) this anthology accumulated 35 stars (58%).